Purchase a sewing machine, embroidery machine or serger from The Sewing Connection is only the beginning. In addition, you will also receive free machine mastery classes and four years of service and repair. We care about our customers and want to make sure that each and every one will use and enjoy their new machine for many years to come. Our expert service technician Jerald, has over 24 years experience working with Gammel Quilting Machines. He is also a Husqvarna Viking factory trained and certified specialist so you can trust him to work on your Husqvarna Viking or any other make or model of sewing machine. We are so certain of Jerald's skills, that we guarantee his work. If he can't repair your machine, you won't be charged. $49.95 for complete cleaning plus parts. 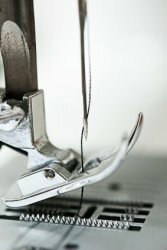 Repairs all manufacturer sewing, embroidery and sergers.